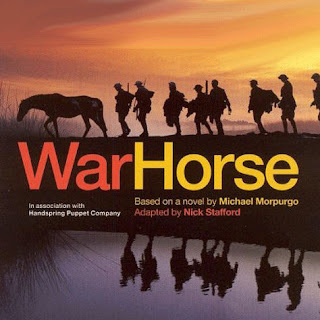 War Horse is a piece of high-voltage populist theatricality, like The Lion King – the kind of show that underlines the uniqueness of the live theatre experience and can make lifelong theatergoers out of young audiences. It’s an adaptation by Nick Stafford of a children’s novel by Michael Morpurgo that opened five years ago at the National Theatre of Great Britain and is still playing to full houses in London’s West End, where it transferred after its NT run. The production, co-directed by Marianne Elliott and Tom Morris, opened in the spring at Lincoln Center with a fresh cast (considerably fresher than the one I saw in London in June). The play begins in Devon, England in 1912, where a farm boy named Albert Narracott (Seth Numrich) falls in love with a beautiful chestnut horse that his father, Ted (Boris McGiver), buys impulsively at auction, really just to get a leg up on his older brother Arthur (T. Ryder Smith), who’s bidding for the same animal. The brothers’ relationship is poisonously competitive, though rarely equal. Arthur is constantly needling Ted, throwing his financial success and his record of service in the Boer War – when Ted stayed home to support his family – in his face, and when Ted has had a few drinks he can’t resist the bait. The horse is an impractical purchase: it’s a hunter, not a work animal, so it’s of no use on the farm, as his wife Rose (Alyssa Bresnahan) is quick to point out. But true to a certain kind of coming-of-age narrative – National Velvet (1944) and The Black Stallion (1979) would be the key examples from American movies – the proud, noble animal exerts a magical pull on the boy, who names him Joey and tames him. Arthur wants the horse for himself, so he gets his brother drunk and bets him the mortgage money that he can’t train Joey to haul a wagon, knowing that if he loses he’ll have no choice but to sell the horse to Arthur. When Ted’s impatient efforts to train Joey aggravate the horse into kicking him, his impulse is to administer a savage beating, so an incensed Albert goes to work himself to try to win his father’s unlikely bet for him. And in an archetypal scene Joey surpasses everyone’s expectations and drags the wagon over the designated line. The resulting idyll of horse and boy is disturbed when war breaks out two years later, however. 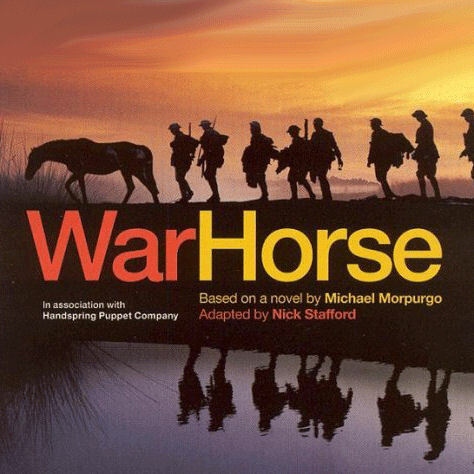 Ted sells Joey to the army behind his son’s back; only the guarantee of Lieutenant Nicholls (Stephen Plunkett), who admires the horse and has been making sketches of him, that he’ll take personal care of him calms Albert. But Nicholls falls in battle and his sketchbook is sent home to Albert. The boy, terrified about Joey’s fate and still furious at his father, lies about his age (he’s only sixteen at this point) and signs up so that he can search for his beloved horse. That’s the first act. Act two intercuts Joey’s and Albert’s adventures during the course of the war, with other characters – a German horseman named Müller (Peter Hermann), a traumatized little French girl (Madeleine Rose Yen) – replacing Albert as the human figure in most intimate contact with Joey. The script is shrewdly laid out so that characters and incidents in the second act echo earlier ones; this rhyming tendency is partly what makes the story feel like a legend. Yet Stafford resists the temptation to divide the characters into heroes and villains. Ted Narracott is foolish and he makes rash judgments, qualities that are exacerbated by his drinking, but he doesn’t mean his son any harm; in his hobbled way he tries to make amends after Rose shows him how unfair it was to go back on his bargain that Albert could keep the horse he’d tamed. Arthur’s son Billy (Matt Doyle) enjoys ragging on his cousin – an outgrowth of the way he sees his father treat his uncle. But your heart breaks when his father sends him to war with his grandfather’s knife as a memento, insisting despite the boy’s frightened reluctance that he remain faithful to two generations of warriors, and the boy is shot down trying to retrieve the knife. Our attitude toward Arthur shifts too, when his son is reported lost in battle. The only villain, in Stafford’s view, is the damnable war itself. The style of the production is theatricalism, which always keeps us aware that we’re watching a play. (Brechtian theatre does as well, but unlike in Brecht the theatrical devices Elliott and Morris employ don’t interrupt our emotional engagement with the action.) A narrator figure called Song Man (Liam Robinson) enhances the narrative, often in league with the ensemble, with stirring folk melodies by Adrian Sutton, the two most memorable of which are “Only Remembered,” a sort of anthem for the play, and “The Year Turns Round Again,” which links the boy’s and the horse’s tribulations to the cycle of life (and thus provides the hopeful note that a storybook tale like this one demands). Sutton also provides instrumental music that operates as a soundtrack, markedly during battle scenes. A scrap of cyclorama hung over the stage, a visual echo of the drawings of Joey in Nicholls’ sketchbook, becomes the medium for projections of all kinds: images of farmlands and battlefields, information about setting, abstract representations of the fighting. (Rae Smith designed the drawings as well as the sets and costumes.) And the animals, especially the horses (Joey joins a gray-black stallion called Topthorn when he’s sold to the army) but also a goose and some birds, are represented by life-size puppets supplied by the Handspring Puppet Company. The magnificent horses may be the most intricately designed puppets every seen on a mainstream stage, though the authenticity of the detail with which these wire, wood and canvas creations have been furnished is no less impressive than the work of the puppeteers – three to a horse – who manipulate them, under the masterly direction of Toby Sedgwick. The collaboration of all these artists is seamless: you hardly know whom to praise for the thrilling image of the foal Joey metamorphosing, through a kind of theatrical time-lapse effect, into a fully grown hunter, or the deeply unsettling one of a pair of vultures preying on dead soldiers downstage. The scene in which Albert persuades Joey to take a saddle by standing with his back to the horse, lifting the saddle over his head and letting the horse sniff it experimentally, has both extraordinary charm and primal power. 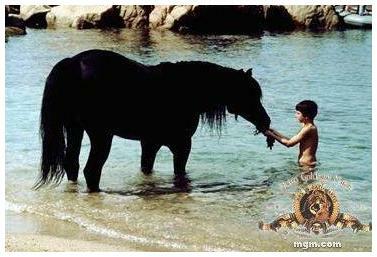 You think of the scene in The Black Stallion where Alec holds out a hand full of grass and lets The Black smell and nuzzle it, and of course the one where Alec plays tag with The Black along the seashore until the horse is ready to let him leap onto his back. But in act two, when a new puppet appears in the form of a tank, you can see where the play is going – how its creators have drawn on the genre of the coming of age (with animal) story to set up an anti-war narrative, with Joey and Topthorn standing in for all those who fight the war, including Albert and Billy Narracott and Captain Nicholls and Albert’s comrade in arms David Taylor (David Pegram). Elliott and Morris seem to be quoting the great French anti-war film Forbidden Games (1952) in their use of the French child Emilie whose mother’s farm the German commandeer as a clearing station. The young actress Madeleine Rose Yen is quite amazing in this part: her feelings whip out of her uncontrolled. But then, the entire cast is commendable, especially Numrich, Bresnahan and Hermann. War Horse took home last season’s Tony Award for Best Play. Among the new shows I saw over the course of the year there wasn’t even a close competitor. How I wish I have the chance to watch that live theater. If ever I will be moving in London, maybe I have the chance to watch that since it is still played in full houses.